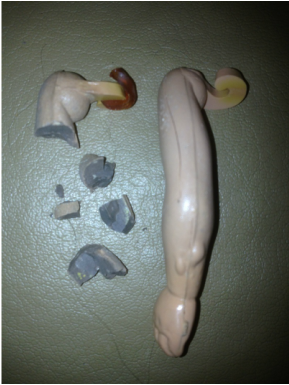 A number of dolls that we have repaired, or are in the process of repairing, suffer from hard plastic disease (HPD). We don't know for certain what causes HPD; an unstable mix of plastics, maybe. In those early days of the 1950s, manufacturers were constantly experimenting, but as so few of the companies are still in existence, and we don't have records, the cause can't be pinpointed. At the time, plastic was a wonder product, and it's possible that manufacturers were a little too enthusiastic, introducing it without carrying out stringent tests. All we know is that in the early 1990s, collectors became aware of an unwelcome condition affecting certain plastic dolls which eventually made the plastic go into meltdown, causing the dolls to literally disintegrate. Unfortunately, as the condition was first spotted in Pedigree dolls, it was given the name 'Pedigree Doll Disease' (PDD), which put Pedigree in a bad light, and was very unfair. When it was realized that the condition could affect other makes of hard plastic dolls, the name was changed to 'hard plastic disease' (HPD). It is important to stress that this condition is relatively rare, and provided certain precautions are taken, the majority of doll collectors will never find the disease amongst their dolls. However, it is important that collectors of hard plastic dolls are aware of the condition and are alert for early symptoms. Provided care is taken with new dolls introduced to the collection, and they are stored correctly, there should be no problems. Some authorities state that the disease is caused by a reaction of metal to plastic, due to rusting of the metal eye pieces or joining rods. Many agree that poor storage conditions are to blame such as storing the doll in a damp loft, warm, moist conditions or wrapped in a plastic bag. High humidity also plays its part. Frequently, the first indication of HPD is a smell of vinegar, or acetone, a lingering unpleasant smell. Usually, hard plastic has no smell, or just a very faint odor. Further warning signs can be small vertical lines around the nose, roughening around the wrists, noticeable loss of color (especially in a limb), odd pink or red blotches or the head forming an extreme point, like a Kewpie doll. Another symptom is a pink or red groove appearing across the doll's nose, and which eventually spreads to give a 'pinched' look, as though the doll has caught a cold. In extreme cases the doll will warp until the whole body appears misshapen. White crusty patches will appear on the surface of the plastic, and then a brown liquid will ooze from the doll; she is literally dissolving. BUT it is important to remember that a crack, red mark or line will not necessarily mean that your doll is going to self-destruct! In the majority of cases these are just symptoms of play, natural stress or ageing. If, however, you do suspect that your doll has the disease, then it is important to immediately isolate it from any other plastic dolls, because HPD can spread. Detached advisors will tell you to put the doll in the rubbish bin, but his is not an easy thing to do with a treasured doll, which may well be one owned since childhood. Obviously if the doll really smells badly, or was leaking liquid, you would not want to keep it anyway, but if the symptoms are mild, then you could wrap it in tissue or muslin and place in a box, in a different room to your dolls - one that is dry and airy - or even a dry garden shed or garage. HPD only affects dolls made from hard plastic, so vinyl types are fine, although they can attract other problems such as stickiness and color spots. Please don't let the faint possibility of HPD stop you from collecting hard plastic dolls. Enjoy them and handle them regularly - dolls that are gently 'played with' are far less likely to suffer than those which stay undistrubed in glass airless cases. Here is another link with more information on identifying dolls with HPD.